Oe part number for reference :- RTC3534. Wheel Nuts Hi lift jacks & Acc. Tyres Safari Snorkes Defender Parts Discovery Parts Range Rover Parts Wheels Tools Gift Ideas Series Discovery 1 89-93 Discovery 1 94-98 Discovery 2 99-04 Range Rover Classic Range Rover P38 Range Rover l322 Freelander Discovery 3 Defender 90 & 110. Land Rover Discovery 3 / 4. Un recargo del 15% será aplicado por artículos devueltos. Envíos a Canarias y Baleares tendrán un costo extra. Contáctanos para el precio. Envío gratis en la península. Land Rover Freelander 1997-2006. Un recargo del 15% será aplicado por artículos devueltos. Envíos a Canarias y Baleares tendrán un costo extra. Contáctanos para el precio. Envío gratis en la península. Equivalent to Land Rover RTC3534 (part No. used for reference only). DLS LAND ROVER SPARES UK. Series 2/2a/3 –All models to June 1980. Wheel Bearing Kit. UK MAINLAND Flat Rate to 30kgs = FREE. Kit includes. Land Rover Defender 90, 110. Front Wheel Bearing Kit. Up to 1993. 2 x axle oil seals,1 x circlip. 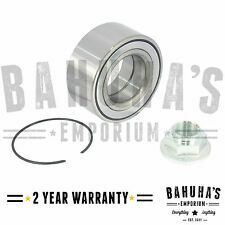 Land Rover Series Wheel Bearing Kit x 2. Enough For Both sides of Front or Rear Axle. Series III 88 All models up to Sept 1980. Series III 109 All models up to Sept 1980. Series IIA 88 All models,  Series IIA 109 All models. Up to VIN - JA. Land Rover Discovery 1. Wheel Bearing Kit. 2 x Axle Oil Seals. 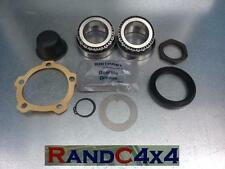 Land Rover Defender Hub / Wheel Bearing Kit. 2 x Wheel Bearing. Front and Rear from 1999 to 2006. Stake nut fitted instead. Kit Includes. Kardanwelle Gelenk Für LAND ROVER. Zustand: Das neue unverbrauchte Ersatzteil. (Kompatible Fahrzeuge unter anderem. Siehe Fahrzeugliste). Das Teil funktioniert einwandfrei und wurde noch nie eingebaut. Part Number - RTC3537. 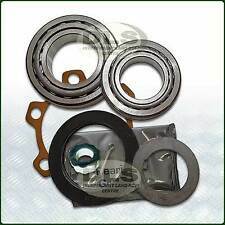 Front & rear wheel bearing kit with Timken bearings for Land Rover Series 3 - SWB / LWB from 1980. Land Rover Discovery 1, 300TDI. Wheel Bearing Kit. OR 1992 ONWARDS. FITS - FRONT OF REAR. FROM VIN - JA ONWARDS. of Quality Assured products at cost Effective Prices. 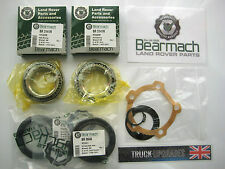 DEFENDER FRONT OR REAR WHEEL BEARING KIT. FITS ALL DEFENDER MODELS FROM CHASSIS No: LA. 2 x TIMKEN BEARINGS. Defender Models from LA chassis number (Aprox 1994). L R Parts Ltd is an authorized Bearmach distributor, we specialize in new Land Rover Spares, stainless steel bolt sets for Land Rovers and general maintenance parts. LAND ROVER DEFENDER 1994 ONWARDS FROM VIN LA. LAND ROVER DISCOVERY 1 1992 ONWARDS. 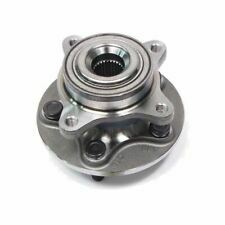 2 X WHEEL BEARING STC4382. 1 X LOCK WASHER. THIS WILL FIT FRONT OR REAR OR LEFT OR RIGHT. THIS KIT CONSIST OF. Land Rover Defender 90, Discovery 1. Defender 90 ,110, 130 From VIN LA ( 1994 Onwards). Discovery 1, only from 1992 onwards. Wheel Bearing Kit. TWO KITS - ENOUGH TO COMPLETE ONE AXLE. 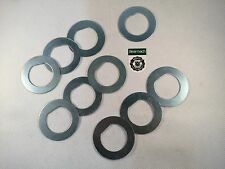 Sub Axle Oil Seals, Lock Washers. These fit either front left or right hand sides, kit includes as per the photo, 2 x Bearings, Oil Seals, Gasket and Lock Washer. Add to Favourites. Nueva parte de calidad ahora completo con kit de montaje! BRAND NEW TOP QUALITY WHEEL BEARING. LAND ROVER FREELANDER 1 IRD / TRANSFER BOX (SMALL) PINION BEARING - NUMBER 51. RTC3534 Land Rover serie 2 2a 3 88" 109" delantera o trasera con Kit completo. Manufacturer Part Number RTC3534. Reference OE/OEM Number RTC3534. Wheel Nuts Hi lift jacks & Acc. Tyres Safari Snorkes Defender Parts Discovery Parts Range Rover Parts Wheels Tools Gift Ideas Series Discovery 1 89-93 Discovery 1 94-98 Discovery 2 99-04 Range Rover Classic Range Rover P38 Range Rover l322 Freelander Discovery 3 Defender 90 & 110. Equivalent to part number:- ANR5861. 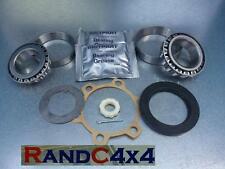 Land Rover Freelander 1 Wheel Bearing Kit. Land Rover Freelander 1 1997 to 2001. Bearing is Suitable for front or rear hubs. Any item which has failed will be subject to their inspection. Disco 3/4 Rear Prop Centre Bearing. Land Rover Discovery 3 & 4, (2004-2016). Land Rover Parts & Accessories. 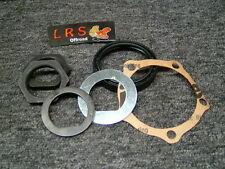 Land Rover Parts. Discovery Parts. Series 2 & 3 - Defender 90/110/130, Discovery 1,2,3,4,5 & Sport - Freelander 1 & 2 - Range Rover Classic, P38, L322, L405, Sport & Evoque. This kit contains GENUINE TIMKEN or NTN bearings. 2 x TIMKEN or NTN Bearings, 2 x Bearing Grease 2 x Lock Washer, 2 x Flange Gasket, 1 x Hub Oil Seal, 1 x Flange Circlip. Extra parts are included to cover variations. 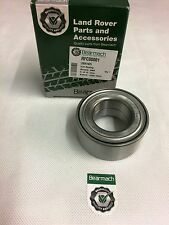 Land Rover Series Wheel Bearing Kit x 1. Fits Front or Rear Axle.  Series III 88 All models up to Sept 1980.  Series III 109 All models up to Sept 1980. Series IIA 88 All models,  Series IIA 109 All models. LT230 & LT95 Transmission. Transfer Gearbox Output Shaft - Genuine Land Rover. Land Rover Defender 90, Discovery 1. Defender 90, From VIN LA ( 1994 Onwards). Discovery 1, only from 1992 onwards. Wheel Bearing Kit X 2. EVERYTHING TO COMPLETE A BEARING CHANGE. Fits both Front or Rear. Part Number:- DA2379. Defender 200 Tdi. Wheel Nuts Hi lift jacks & Acc. Tyres Safari Snorkes Defender Parts Discovery Parts Range Rover Parts Wheels Tools Gift Ideas Series Discovery 1 89-93 Discovery 1 94-98 Discovery 2 99-04 Range Rover Classic Range Rover P38 Range Rover l322 Freelander Discovery 3 Defender 90 & 110. Land Rover Defender 90, 110. 4 X TIMKEN BEARINGS. Front Wheel Bearing Kit X2. Enough here for both sides of front axle. 2 x gaskets. LAND ROVER RANGE ROVER SPORT L320 2.7,3.6,4.2,4.4 & DISCOVERY 2.7 TDV6 MK3 | 3.0 TDV6 MK4. 2005-2013 FRONT WHEEL BEARINGS HUBS x 2 PAIR. Buy from a Genuine Motor Factor with over 33 years experience. Bearing Seal Overhaul Kit For Land Rover Discovery 3 Transfer Box 2005 - 2009 Kit Contains:- > 4 Main Drive Bearings > Rear Output Flange Bottom Needle Bearing > Actuator Shaft Bearing > Drive Flange Snap Rings > Input Oil Seal > Front Output Oil Seal > Rear Output Oil Seal Fits All Land Rover Discovery 3 Transfer Boxes DD295 Check our other listings for Front and Rear Output Drive Flanges IEA500031, IEA500041, LR039528. Verwendung (Angaben ohne Gewähr). FORD YM213B437A. TAPA SUAVE DE FREELANDER MK 1. FREELANDER MK 1. FREELANDER MK 2. anillo ABS. Los sensores del ABS. LAND ROVER DISCOVERY 3 ÁRBOL DE HÉLICE-PROP-PR. LAND ROVER. LA GAMA ROVER SPORT/LAND ROVER PASOS LATERALES. FROM VIN - JA ONWARDS. Land Rover Discovery 1, 300TDI. Wheel Bearing Kits X2. FITS - FRONT OF REAR. Enough here for both sides of One Axle. of Quality Assured products at cost Effective Prices. These fit either left or right hand sides and both front and rear of your vehicle, kit includes as per the photo, 2 x Bearings, Oil Seal, Gasket, and Lock Washer. Add to Favourites. NUOVO Cuscinetto Idraulico OEM Land Rover Defender 90 110 TD4 2007->. o ritiro in zona gratuito. LAND ROVER RANGE ROVER SPORT L320 2.7,3.6,4.2,4.4 & DISCOVERY 2.7 TDV6 MK3 | 3.0 TDV6 MK4. 2005-2013 FRONT WHEEL BEARING HUB. Buy from a Genuine Motor Factor with over 33 years experience. Crankshaft Pulley. Anti Roll Bar link. Oil Sump Pan. Lower Ball. LAND ROVER. DISCOVERY MK 2. AB31to>38, AB43to>56, BT>ALL, FK19to>21, IM>ALL, IV>ALL. Wheel Hubs and Bearings. OE LR037027, TVB500360. LAND ROVER DISCOVERY MK3 2005 - 2009. LAND ROVER DISCOVERY MK4 ALL MODELS FROM 2009 ONWARDS. FITS ALL DISCOVERY 3 & 4. CENTER BEARING. 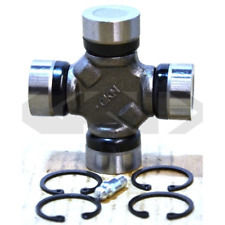 Land Rover Defender Front or Rear Wheel Bearing Kit. Defender Parts. Land Rover Defender, All Models. Series 2 & 3 - Defender 90/110/130, Discovery 1,2,3,4,5 & Sport - Freelander 1 & 2 - Range Rover Classic, P38, L322, L405, Sport & Evoque. LAND ROVER RANGE ROVER SPORT (L320). from 2005 to 2013. Can't find what you're looking for?. Looking to place a bulk order?. to fit the following vehicles.